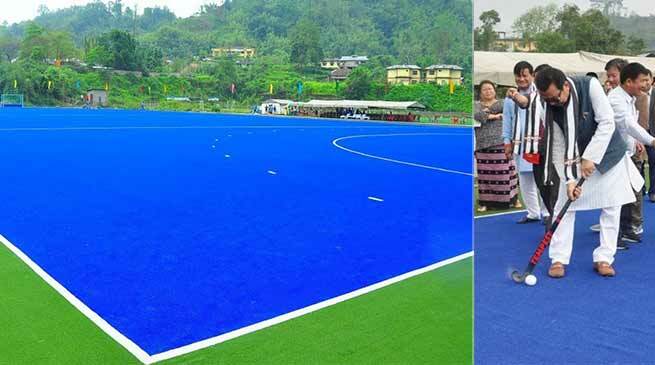 Deputy Chief Minister of Arunachal Pradesh, Chowna Mein inaugurated the world class Astro-Turf Hockey Ground at Sangay Lhaden Sports Academy, Chimpu here today. Mein said that Sangay Lhaden Sports Academy is the centre of sports activities in the State and lauded the Sports Academy for their endeavour in tapping the hidden sports talents of the State and for imparting scientific training and coaching to them besides providing academic education. He said that young sports man & woman of the State has brought laurels to the state in many Zonal, National and International level sports competitions/championship in Boxing, Judo Weightlifting, Wushu, Table Tennis and Badminton, etc. He also lauded the Arunachal women and men who have also earned a niche for the State in the field of mountaineering. While citing that there is no dearth of sports talents in the State, he emphasized on providing more training facilities and urged the Sports Academy to upgrade the level of competitions and produce more sports persons like that of the Manipur from our State too. He also said to encourage and involve maximum numbers of youths to take part in games & sports activities to counter the prevailing social evils like drug addictions. He said that the sports facilities will not only be concentrated to the State Capital but it will also be extended to the district headquarters too. One more State of the Art Sports Academy will be established in Tirap, Changlang and Longding (TCL) region which was also announced during the Budget Speech and seven new major stadiums are also coming up in Yupia, Pasighat, Ziro, Daporijo, Chimpu , Aalo and Tezu, out of which the construction work of Yupia, Pasighat, Ziro and Daporijo is on the verge of completion. Mein while assuring to strengthen the men power of the Department of Sports & Youth Affairs, asked Parliamentary Secretary for Sports & Youth Affairs to send the proposal to place it before the Cabinet. He also asked the Department to submit the DPR for Rostrum and public gallery around the Hockey & Football Ground at Sangay Lhaden Sports Academy and assured to provide fund for the same. Deputy Director of Sports (Technical), Heri Robin informed that Astro-Turf Hockey Ground is the first project of its kind in the State funded under the ‘Khelo India Scheme’ a flagship programme of the Ministry of Youth Affairs and Sports, Govt of India. It was constructed by the Engineering Wing of the Department of Sports with an estimated cost of Rs 500 lakhs. He also informed that the Hockey turf was imported from the USA and international size and standard of the ground were maintained so that the national and international games can be conducted on this ground. He further informed that water supply provision for the ground and cover drain were also installed around the ground to prevent water logging and players can practice in all types of weathers here. Managing Director, Khelo India, Gumnya Karbak and Deputy Director of Sports, Mala Linggi also spoke on the occasion. Among others, Parliamentary Secretary for Sports & Youth Affairs, Nyamar Karbak, Vice-Chairman Sports Authority of Arunachal Pradesh, Doni Nich, Vice-Chairman Arunachal Olympic Association, G Doke, President All Arunachal Hockey Association, Gumjum Haider, Secretary, Sports & Youth Affairs, Dani Salu and Director Sports, Tadar Appa were also present on the occasion.